Just a quick drop-in to say "hey"! I haven't much time at the computer but wanted to update with a few thoughts of what might be goin' on. I have an urgent need to be getting some work....like work where you actually get paid! Tossing some ideas around with friends, and have come up with a couple of possibilities. At our CSA farm there are new folks joining every season and many of them have absolutely no idea how to prepare some of the more unusual veggies. I could offer my services as a "one time only" thing, or a series of perhaps 4 sessions. Or...someone who comes in once a week to shop, prep, and cook a meal. For example...how to make a pot of chicken noodle soup from scratch. Anyways....just a few thoughts racing around this ol' gal's head. Ooh...how about preparing healthy, good-for-you meals for those that are house-bound by illness or are recovering from surgery? I even have a few ideas for a business name! I could market myself as someone who could come into your home and analyze how you WANT to eat, as opposed to HOW you are currently eating. Some folks just need a little nudge to send them in the right direction. I have 40 years of homemaking experience under my belt, with the last 8 or so focusing on healthy, organic, etc. As a plus, I have been told by our CSA farm owners that I could be somehow connected to the farm as an independent contractor, using the farm and the experience I have there as a teacher/assistant as a reference point. Any ideas from you all would be greatly appreciated! I have a friend who does a lot like what you are talking about. She also teaches soap making classes and herbal classes in her home on the weekends. She teaches the methods with good recipes, but she keeps her best recipes secret so her soap sales don't suffer. She has also arranged to teach classes through the local community college. If you have an organization in your area like we do, that promotes local ag, you can make connections through that - though it sounds like you already have pretty good inroads there. Out of your list of possible names, I like "Eat Right At Home", and your ideas are wonderful. You're right that some poele just need a starting point. It amazes me that not everyone can think and create as well as others. Your talents and experience would be a big help and something a lot of people would be willing to pay for. Congrats on your new venture! Cyn, many years ago I taught a seminar for people who wanted to do just what you want to do: Create a career or job based on what they liked to do, on their idea of what their lifestyle could be. If you can find a copy of the book "Wishcarft," you may find it helpful. I want to do the same thing someday - come up with a job that makes me happy and truly fulfills me. Lots of people are doing that these days and doing it successfully. Good luck - I love your ideas! Check to see if your regional branch of Michigan Works has a Small Business Technology & Development Center with a small business counselor who can help you prepare a business and marketing plan and turn your ideas into reality! Your local chamber may be able to point you in the right direction. p.s. If I lived in your area, I would totally sign up for this!!! 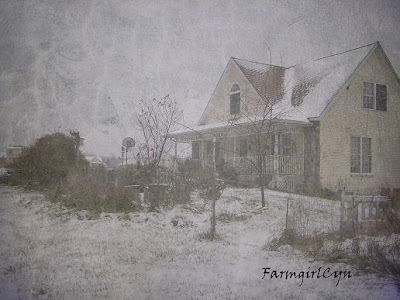 Love that textured picture of the farmhouse! Sounds like a great idea to cook for folks. A once-a-week shopping and cooking setup sounds very promising. Also the idea for homebound folks. I like the name House Call Suppers the best! Make sure that you check with local ordinances to see if you need a permit (e.g., health department) since it would be commercial food preparation. they have some free classes as well as a 10 week class that I'm taking for the brewery. Whoa!! GREAT ideas Cindy!! I am sure you would do fabulously with any or all of those ideas. For the *going into the home* sort of thing, I like the name "House Call Suppers" or you could say "House Call Cook"...so that you are not limited to the evening meal. Keep us posted! BTW...I *love* that photo at the top of your post. Incredible how things change with the seasons. Can you believe it was sweltering hot there only a few months ago?! Eat Right at Home is a very catchy title! What service this would be to so many that don't know where to start. Blessings to you as you figure out the details. Wonderful! Just want to tell you to start small, and build as you go along. That way you won't be overwhelmed and your reputation will spread and you can pick and choose what you really want to do! Keep us posted, as you have time, please! What a great idea - I hope it all works out well for you! Hope you are keeping well & find the exact position meant for you! I am praying that all you touch will be blessed! You are a blessing to us all! What fabulous ideas! I would totally come to a how too cooking class and I think many would. Your ideas will work. Go for it!